The Cummins 6BT is the most famous truck engine of B series. The 5.9l Cummins engine was the first diesel engine used in full-size pickup trucks as an alternative to the big V8 gasoline engines. The production was started in 1984. It was designed as an engine for Case agricultural equipment. But in the future, the 6BT was widely used in light, medium and some heavy-duty trucks and buses. 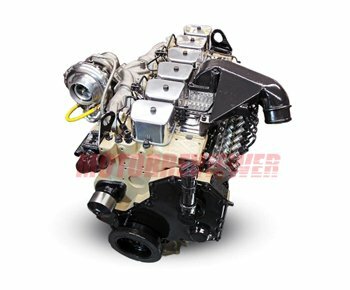 The turbocharged 12 Valve Cummins engine found huge popularity in 1989-1998 model year Dodge Ram pickup trucks for a massive torque at low rpm and all engine speed range, and a better fuel mileage compares to Dodge’s gasoline V8 engines. The engine has the smaller brother with better fuel economy - 3.9L 4BT engine. They both have the same architecture (inline engine) but a different number of cylinders. The Cummins 6BT engine is inline six cylinders 5.9-liter turbocharged diesel engine (turbodiesel). The engine has cast iron engine block and cylinder head. The valvetrain is 12 valve OHV (2 valves per cylinder), solid tappets. In this order, the engine is called as 12-valve Cummins very often. There is a set of timing gears at the front end of the engine, no belts or chains. An oil pump and a fuel pump are driven by gears also. The engine has reliable and mechanical injection pump (easy for tuning) and fuel injectors. Before 1994 the engines were equipped with Bosch VE44 rotary injection pump, but some early versions have CAV rotary injection pump. 1994+ engines have Bosch P7100 injection pump. All 5.9l engines were equipped with a turbocharger and since 1991 with air-to-air intercooler. Holset made all turbochargers - Holset H1C (1989-1993), Holset WH1 (1994), Holset HX35 (1994-1998). For helping to start the engine in cold weather, there is the grid heater mounted on the intake manifold, instead of a traditional glow plug system. The manufacturer offered the engine with such transmissions as Chrysler 47RH (4 speed automatic), New Venture NV4500 (5-speed manual), and GETRAG G360 (5-speed manual). The 12 valve engine was produced before 1998 and then was replaced by the new 24-valve engine with the Bosch high-pressure Common Rail fuel injection system - 5.9L ISB Cummins. The cast iron engine block and the head are the basis for excellent reliability and longevity. There are not a lot of electronics and nothing fancy. The 6BT is a straightforward diesel engine with mechanical pump and injectors. It makes it undemanding to fuel quality. The 12 Valve Cummins engines are well known for starting quickly in any weather condition also. But the engine has some faults. One of them is clogged grid heater. It is mounted between air tube and intake manifold. Over time, the heating element is covered with soot caused restricted airflow into the intake manifold. In this case, an engine takes a little longer to start than usual and sometimes dies while idling or at low rpm's, consumes more fuel. The other problem with 12 valve engine is called as The "Killer Dowel Pin," or KDP. The engine has a steel dowel pin is pressed into the block located near a bolt between timing gear and fuel pump gear. Engine vibration slightly pushes this pin to back out. The pin may fall between the timing gears and cause massive damage to the engine (blend valves, brake pistons, and timing gears). But there are a few very cheap solutions how to prevent the engine from this dramatic outcome on the market.